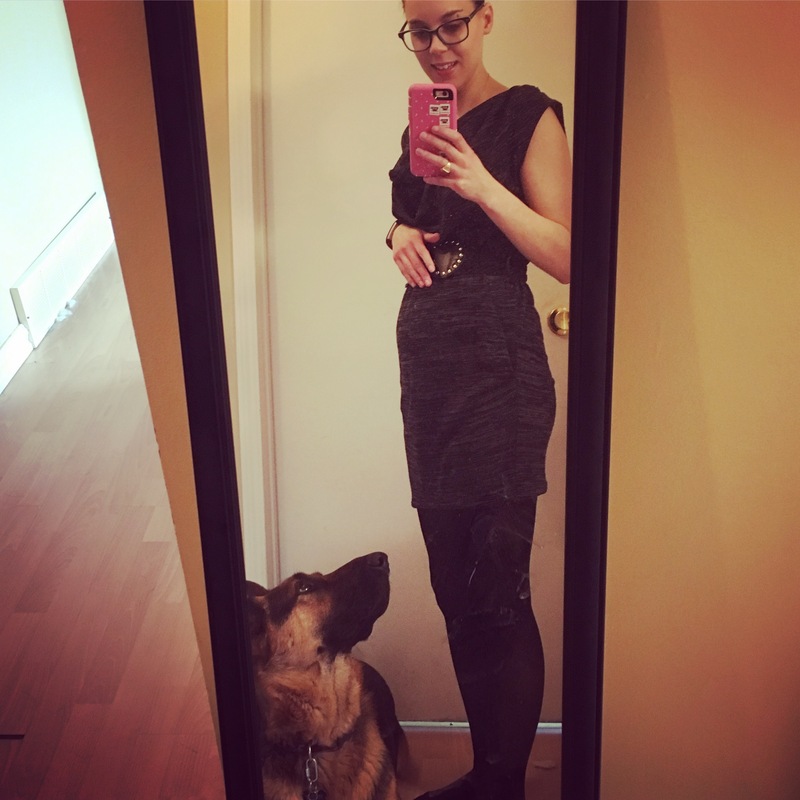 If you follow me on Instagram, you’ll know that my 1.5 year old German Shepherd Bomber is a very prominent feature in my baby bump pictures! 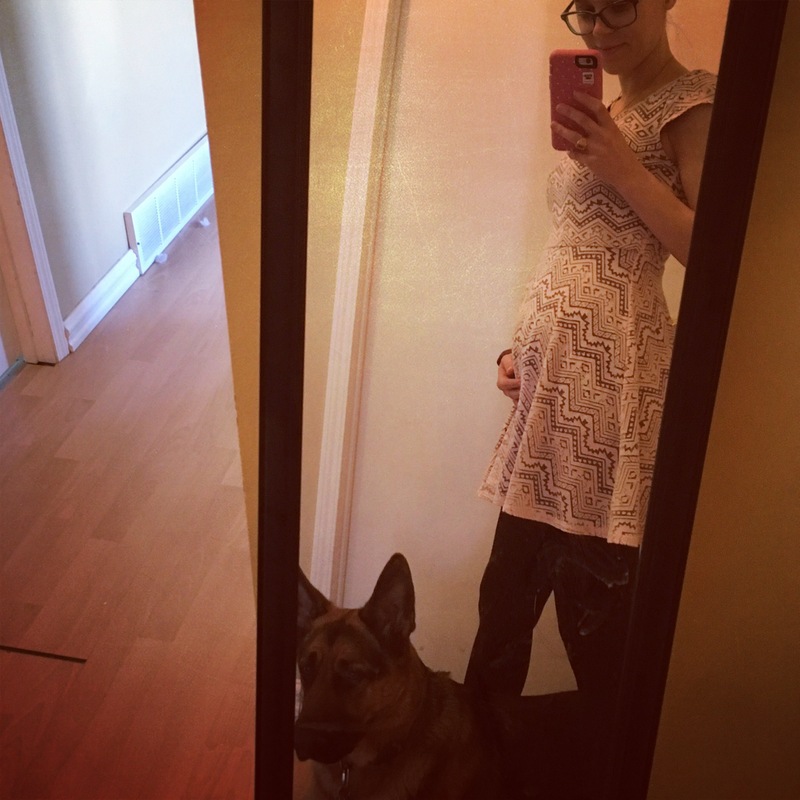 As I’ve said in previous posts, Bomber’s behaviour around me changed before I even knew I was pregnant, and it was one of the things that sparked my curiosity to go to the clinic to see a nurse about a pregnancy test. 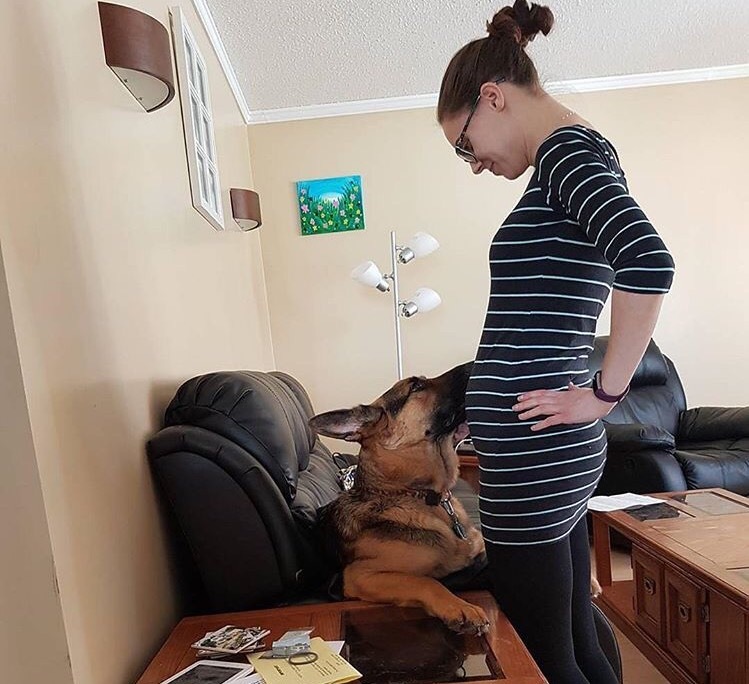 Since then, Bomber has been very protective of me and LOVES the Bump! 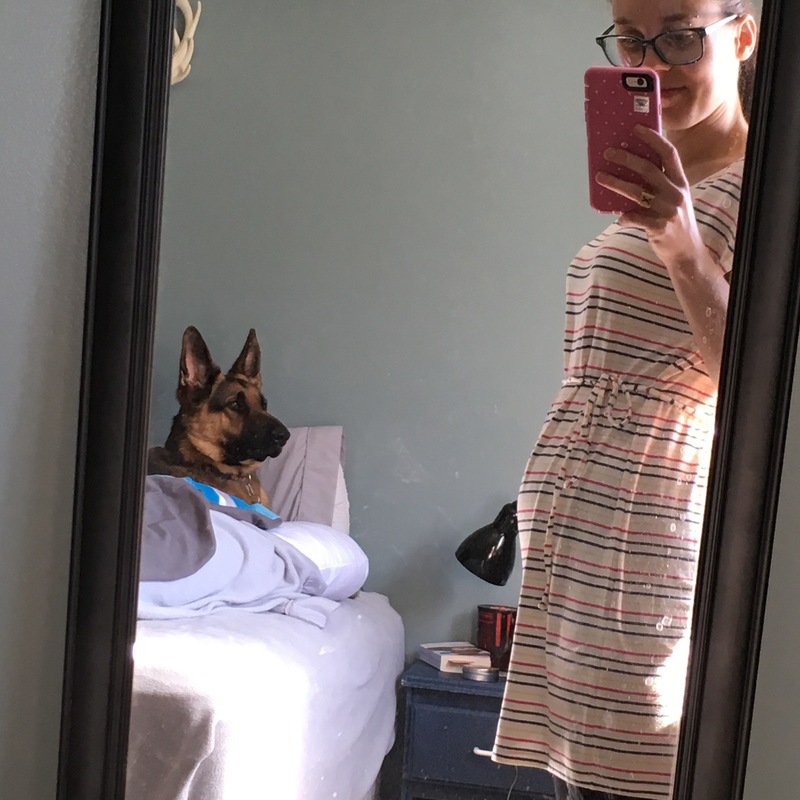 Every time I come into the house he has to inspect my belly to check on the baby, and though he is not a major cuddler, he likes to lay with his head on my belly more often! 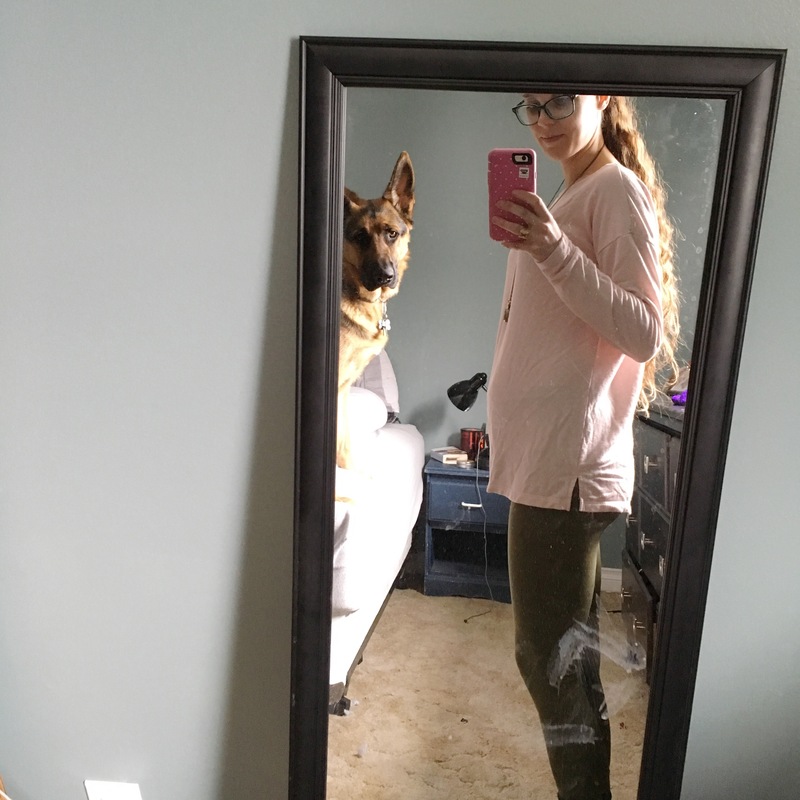 I am pretty sure he has been able to feel/hear the baby a lot longer than I have, because his ears are moving around like mad whenever he is cuddling with me! 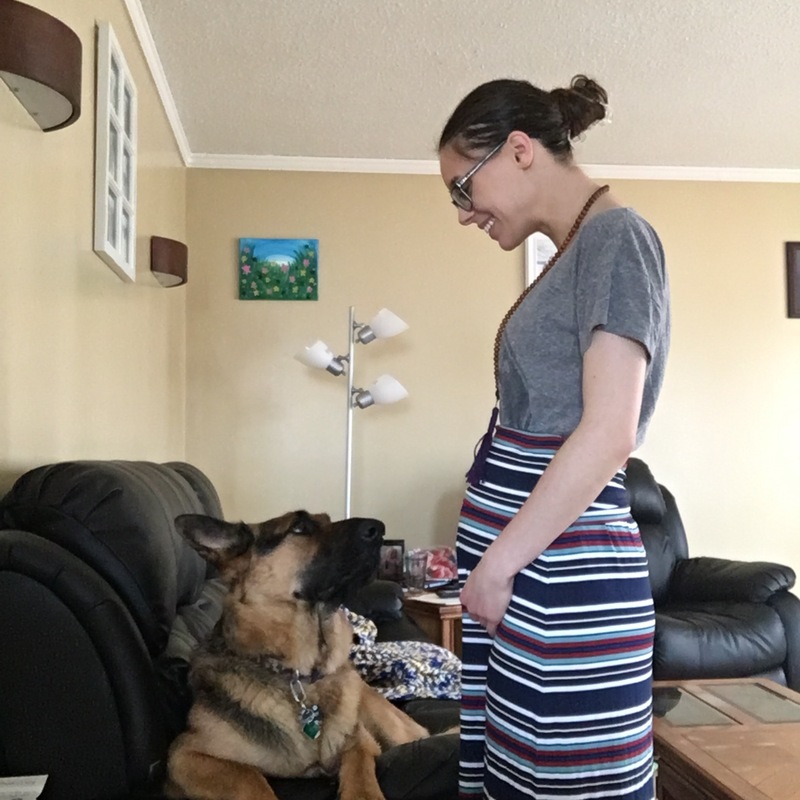 Now that I’be reached the halfway point of my pregnancy (*gasp*) I’ve decided to post a collection of the pictures I’ve taken with Bomber and the Bump (my personal nickname for the baby). These appear in reverse order – most recent first, oldest last! Excuse the nose art, Bomber likes to press his face on every mirror and window he can reach – like most dogs! I also would like to point out that in the picture above and below, Bomber is laying or sitting on my pregnancy pillow – I think he loves it more than me! If I get up to go to the bathroom, he cuddles into it! If he is feeling daring, he tries to push me out of it! We might have to buy a second one so Bomber will let me have mine in peace! I cannot wait for Bomber and Bump to meet, I’m sure they are going to be fast best friends! I’m also excited for the prospect of my child growing up with a pet from birth (we didn’t get a pet until I was a little older in my house growing up), they’ll get to learn how to act around animals, and how to care for an animal. Bomber will also get the little human to protect and love, and get an instant cuddle buddy and eventual playmate! Bomber prefers the company of humans to other dogs 100%! A few of the pictures I staged Bomber into the pictures, others he just happened to be there, I’m not going to pretend that all people who take pictures of their dogs and Instagram them just have their cameras or phones on the ready all the time – we stage way more than you’d think! 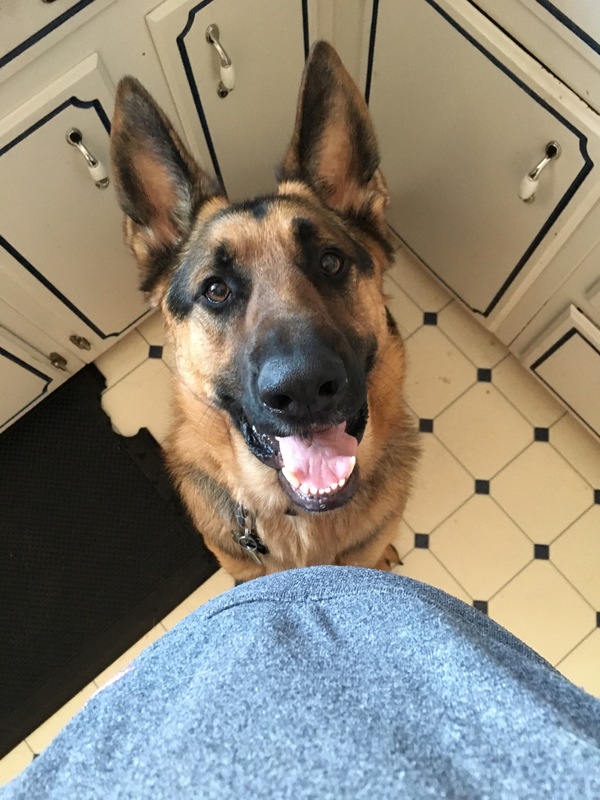 I don’t know about all of the other dogs, but as long as I take the picture in a timely manner – he’s happy to sit and stay! 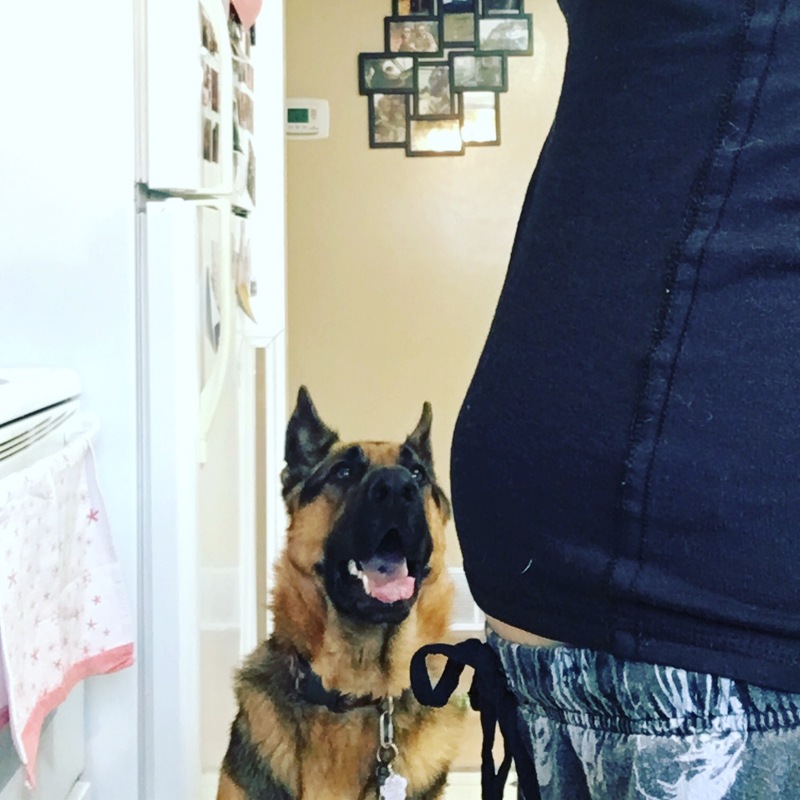 I originally started it out just putting Bomber in the frame, because he’s super cute, and he likes to interact with the Bump, and he is very curious about the changes happening to his Mama! 2017 is turning into a major year of change for us, when we weren’t fully expecting it! We’re becoming a foursome, Bomber’s turning two, we’re doing renovations to the house/yard getting ready for Bump, we’re looking at getting rid of my (lemon) car in favour of a more family friendly vehicle and for the first time in almost 15 years I will be unemployed! Along with all of those changes, I’m going through a lot of physical changes – weight gain, acne, muscle pain, you name it! I’m already struggling with the weight gain, as I’ve never had ‘extra’ weight, I’ve always been a small person. I’m starting to not fit clothes I love properly, I retired my jeans about a month ago (that I wasn’t sad about) and I’m trying my hardest not to cry every time I pick an outfit! Whoever says pregnancy makes you glow obviously hasn’t been pregnant! That being said, I am very excited to becoming a Mum! I feel like it happened at a really good time in my life/our lives as a family! We already own our house and Bomber, our personal debts are in a very manageable place, we have done a lot of the things we wanted to do and don’t feel like we’ll be ‘missing out’ – we are definitely ready for this! I am definitely ready for this! Mamas! 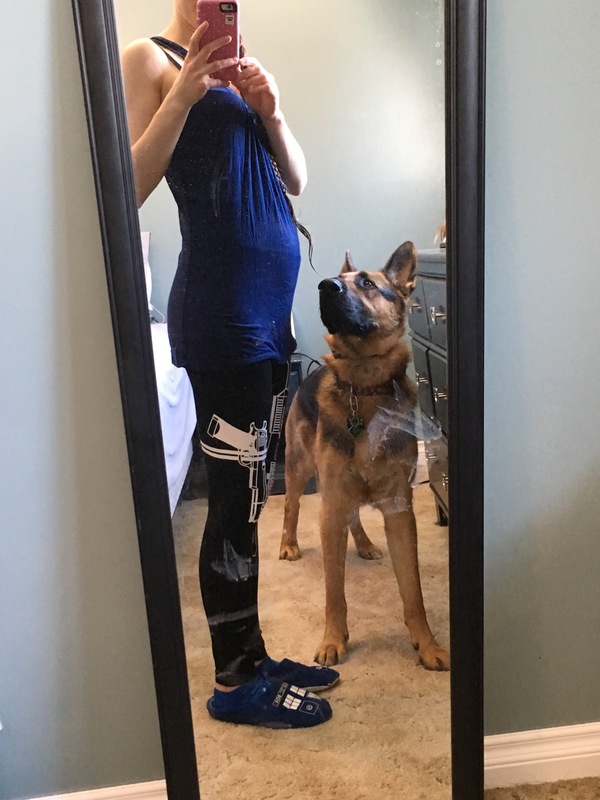 How were your pets while you were pregnant! I want to hear your stories! Previous Post Review of “Griffin of Darkwood” by Becky Citra. Next Post 20 facts about me.